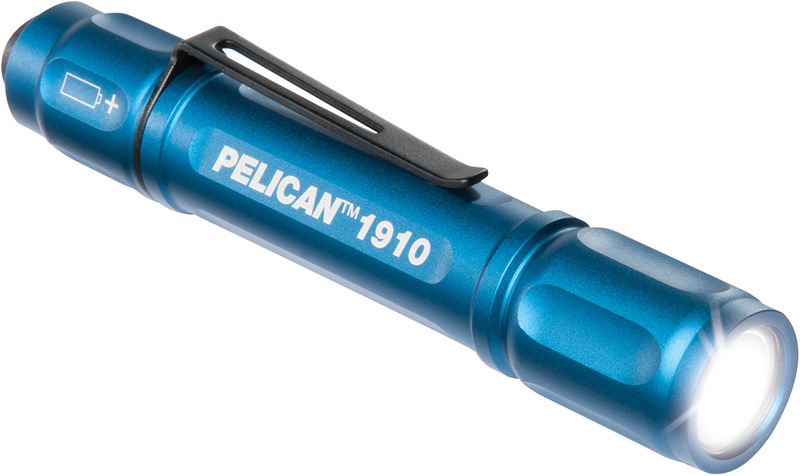 These are the toughest built flashlights on the market! Makes overall flashlight ~ 6" long and 6.6 oz. 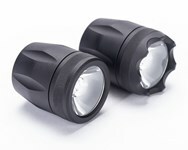 Provides 2.5 hours runtime at full 235 lumen output. Provides 12 hours useful runtime. With Automatic Voltage Sensing (AVS) Technology, new High Output Heads on 2-Cell Flashlight Bodies produce 650 lumens with runtimes of 1 hour 30 minutes* and produce 900 lumens with runtimes of 1 hour 45 minutes* on 3-Cell Bodies. Get this world-class performance whether you purchase a complete new High Output Flashlight or retrofit your existing Elzetta Flashlight with a New High Output Head (all Elzetta Flashlight components are interchangeable, interoperable, and available individually). Momentary activation is achieved by pressing the pushbutton. Constant On is achieved by rotating the Tailcap fully clockwise. Some operators consider this design to be "Tactically Correct"
Momentary activation is achieved by pressing the pushbutton lightly. Constant On is achieved by pressing the pushbutton firmly until it 'Clicks'. Pressing firmly again will Click the Light off. Activation is achieved exactly like the Clicky Tailcap in either the High or Low mode. High Output (235 Lumens) occurs when the Tailcap is rotated fully Clockwise (screwed all the way on). 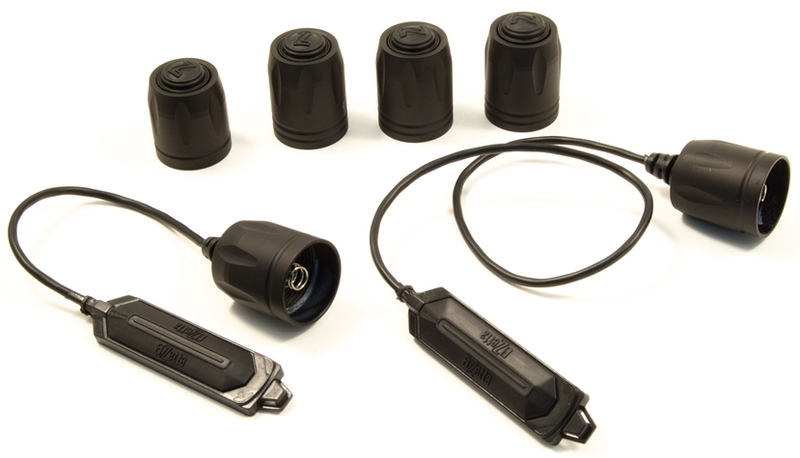 Low Output (~15 Lumens) occurs when the Tailcap is rotated Counter-Clockwise (unscrewed) anywhere from 1/8 to 1/2 rotation from the High position. A simple, intuitive User Interface with great versatility. 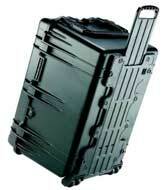 The Remote Tape Switch provides operation of the light via a molded pressure pad. 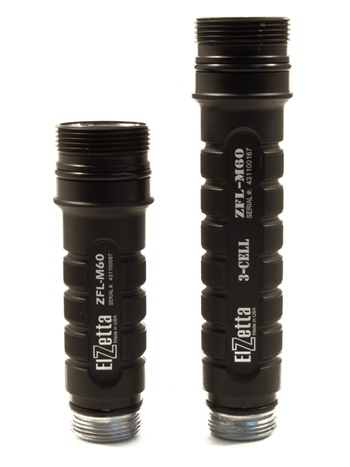 Elzetta's unique constant-on feature allows hands-free operation. Fail-safe constant-on feature remains fully functional even if pressure pad is damaged or cable is severed. 5-inch cable works well with vertical foregrips & applications where hand placement is near the flashlight. 12-inch cable is great for longer barreled weapons or where a greater distance exists between the operator's hand and the flashlight.